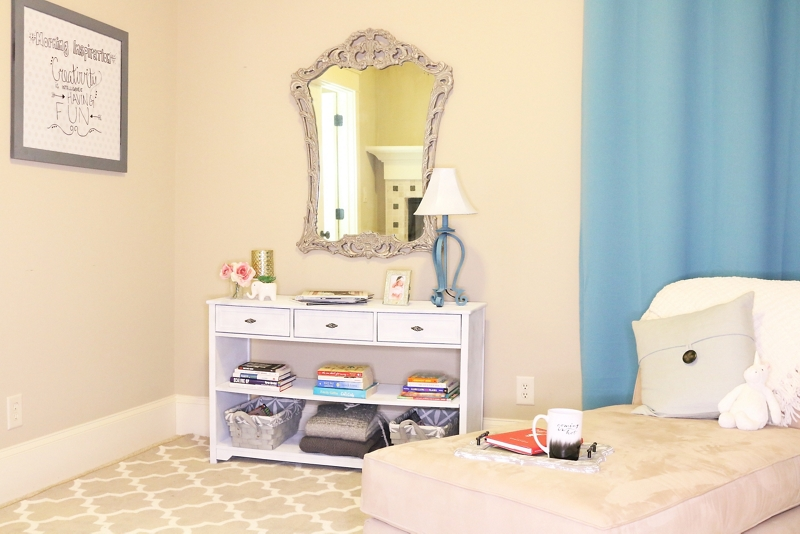 Refresh furniture and home décor pieces to create a cozy reading nook! Begin the spray painting process with the lamp and shade. Remove the shade from the lamp. Use painter’s tape to protect to cover the lamp cord, as well as the hardware on the lamp base and lampshade. Spray the lampshade with Krylon® Chalky Finish Paint in Classic White. Wait 20-30 minutes between coats. Two coats were used to achieve the pictured finish. Spray the lamp base with Krylon® ColorMaster Paint + Primer in Matte Surf. It took fout coats were used to achieve the pictured finish. Next, either remove the glass from the frame or cover it with painter’s tape. Spray the frame with Krylon® Chalky Finish Paint in Slate. Let the frame dry for 20-30 minutes and spray one additional coat. If you covered the glass with painter’s tape, remove when the paint is try to the touch. Before painting the larger furniture piece, remove the drawers and hardware. Spray one coat of Krylon® Chalky Finish Paint in Slate and let it dry for 20-30 minutes, then spray one additional coat. The Slate color will serve as a base when distressing the furniture piece. After the Krylon® Chalky Finish Paint Slate is fully dry, apply three to four of Krylon® Chalky Finish Paint in Classic White, waiting 20-30 minutes between coats. Allow the furniture piece to fully dry. Once the furniture is dry, lightly sand the corners to reveal the Krylon® Chalky Finish Paint Slate color underneath. You can add more dimension by lightly spraying the edges and corners with Slate. Finally, spray the entire furniture piece and frame with Krylon® Chalky Finish Paint Clear Sealer in Matte Clear. Let it dry for 1-2 hours. In addition to these pieces, style your reading nook with a comfortable chair or chaise lounge, pillows, blankets, a tray for drinks and snacks, and your favorite books and magazines!